UNCG is soon to be aglow. Upcoming festivities include musical performances, opportunities to give and decorate, a seasonal art exhibit and a holiday open house, followed by the lighting of the Vacc Bell Tower. And of course, UNCG’s long-standing tradition of luminaires throughout campus. Winter themed novelties, including a photo booth to capture a winter moment. EUC Maple Room, Nov. 30 11 a.m. to 2 p.m. Downtown Greensboro will hold the 28th annual Festival of Lights, Friday, Dec. 2, 6 p.m. to 9 p.m. UNCG will be well-represented. Musical performers include the UNCG Tuba Band and UNGG Sapphires, as well as UNCG alumni Bruce Piephoff, Laura Jane Vincent, the Zinc Kings and the Gate City Railbenders Old Time Stringband. The tree lighting will be in Center City Park and music, crafts and food will be featured up and down Elm St. The Alumni Association will hold their 11th annual Branches of Love celebration Saturday, Dec. 3. Spartans of all ages are invited to help decorate holiday trees that will be donated to local families in transition. Refreshments and holiday music are part of the tradition. Four-person teams can enter to win Best Themed, Best Traditional and Best Overall Tree. Limited ornaments are provided and teams may supply their own decorations. Prizes will be awarded to the winners. Admission is 20 canned or nonperishable food items per team, which will be donated to the Spartan Open Pantry. Doors open at 12 p.m., the tree decorating begins at 12:30 and winners are announced at 1:30. Decorating teams may register here. For those who are interested in contributing to this event but are unable to attend, donations of canned goods and tree decorations can be dropped off at the Office of Alumni Engagement in the Alumni House, 8 a.m. to 5 p.m. weekdays from now until the end of the day Dec. 2. For more information contact Donegan Root at d_root@uncg.edu or 336.256.2013. Sunday, Dec. 4, at First Presbyterian Church, 617 N. Elm St, at 5 p.m.
All faculty and staff are invited to the Chancellor’s Holiday Open House Tuesday, Dec. 6, 4 to 5:30 p.m. The event will be in the Virginia Dare Room of the Alumni House and will be followed by the annual lighting of the Vacc Bell Tower at 5:30 p.m. Hear UNCG’s Vacc Bell Tower’s full carillon of bells played live and see the glow of the traditional luminaires throughout the campus, Dec. 6, 5:30 to 7:30 p.m., at the Vacc Bell Tower and Anniversary Plaza. A student speaker will share the history of the campus luminaires and the Grimsley High School Madrigals will perform. Chancellor Gilliam will make remarks and count down to the lighting of the trees surrounding the Bell Tower. This event is open to the public and parking is available in the Oakland Avenue parking deck. The Weatherspoon Art Museum’s exhibition of Japanese prints from the Lenoir C. Wright Collection will remain open through February 16. The woodblock prints display a variety of winter snow landscapes and subjects. The museum is closed Dec. 24 through January 2, but the exhibition will be open for all other regular hours. The UNCG Staff Senate Angel Tree wrapping party will be Thursday, Dec. 8, at 10 a.m. in Moran Commons. All are invited and refreshments will be provided. Donations are accepted through Dec. 7. See our related post for more details on what is needed for each of the 5 UNCG staff member families – or visit the UNCG Angel Tree website here. The celebratory cry of soccer players and fans can be heard in just about any backyard, field or stadium in the United States and across the globe. Soccer isn’t just the world’s most popular sport. For many, it’s a cultural cornerstone – a rite of passage, a conversation piece and the center of many family activities. And according to UNCG’s Dr. Ignacio Lopez, Alex Hortal and Felipe Troncoso, it’s a tool for teaching. The three faculty members in the Department of Languages, Literatures, and Cultures came up with the idea for their innovative course “Global Crossings: The World Explained by Soccer” at Old Town Draught House, a local pub near campus and their go-to spot for all things soccer. Ninety students are enrolled in the cross-disciplinary, cross-cultural course, which explores a variety of global topics embodied in literature, film, music, art and other cultural practices related to the sport. So how can soccer teach students about important global issues? According to Hortal, something as simple as a soccer ball can be used to explore complex problems. The class has analyzed how soccer is used as a political tool, and how team rivalries often reflect social and economic divisions. In addition, the class has hosted a variety of guest speakers, including former FC Barcelona soccer star José Mari Bakero, as well as representatives from TOPSoccer, a local soccer program for children with disabilities, and Greensboro United Soccer Association. For junior Asha Hashim, a member of UNCG’s Global Village living-learning community, the course has opened her eyes to the impact of the sport worldwide. The collaboration of Lopez, Hortal and Troncoso provides students with unique perspectives on soccer and its impact in different regions. Lopez and Hortal are from Spain, and Troncoso is a native of Chile. The ultimate goal of the course? Facilitate cultural analysis and critical thinking. “The Kindness of Friends,” part of the Weatherspoon’s 75th anniversary celebration, features 38 recently donated pieces displayed in a public exhibition for the very first time. Coming from individual donors’ private collections, the works show a wide variety of styles, periods and subjects. “A potpourri,” is what curator Elaine Gustafson calls “The Kindness of Friends,” currently up in the Gregory D. Ivy Gallery. Despite that the collection of gifted art pieces is highly eclectic, there is also noticeable unity in the exhibition. Gustafson has placed the works in a particular order, with the intention of telling a story. “Hopefully, the art pieces themselves are creating some dialogue with the visitor,” she says. Many of the pieces display humor and satire, and Gustafson has also added to that by often juxtaposing them with one another. Anne Chu’s wildly multicolored bear portrait rests next to a quiet, pale mountain in Tom LaDuke’s “Anaheim.” Simon Hughes’ “Ice-Fishing Tower,” shows tiny, sparkling characters ice fishing within a series of cubicles, and another of his pieces, “Frontier Condominiums,’’ wooden cabin-like structures making up a skyscraper. Placed nearby is Joel Shapiro’s human figure statue made only of several wooden blocks—he is completely square on all edges, but leans backward, resembling a jubilant hitchhiker, as Gustafson sees him. Elsewhere in the exhibit are collage-art pieces with diverse styles but an inherent visual link. The exhibition holds R. B. Kitaj’s prints that were a collaboration with the poet Robert Creeley, “Guggenheim Poster,” by Roy Lichtenstein and “Boomerang,” by Alexander Calder. Donors of art works include UNCG faculty, faculty emeritus and community members. Each work includes a credit to the donor on the placard. This exhibition will be open through Jan. 29. The museum will be closed Dec. 24 through Jan. 2. but open for all other regular hours in December and January. 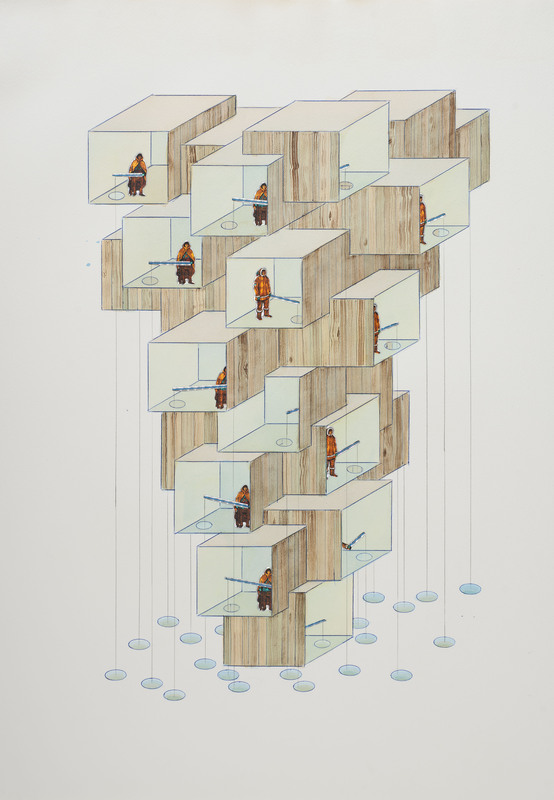 Visual: Simon Hughes, “Ice Fishing Tower,” gift of Scott Morgan and Katy Allgeyer, 2016. If you visit the Human Development and Family Studies (HDFS) professor’s lab while her team collects data, you’ll observe children singing, counting, or playing games. Others might be crying and flailing fists. They’re expressing a wide range of emotional abilities, dependent on their age and experiences. While some children control their impulses by employing various learned strategies, others lack these skills and have trouble delaying gratification or managing frustrating tasks. Their negative emotional responses indicate immature emotional readiness. To help children reach appropriate levels of emotional maturity, adults must recognize their natural responses and know how to handle them, Calkins says. To find the tools parents and caregivers need, she and her team have recruited children from more than 450 families to participate in the RIGHT Track study. Although we can begin to understand emotion regulation by observing the behavior of and collecting information from children and their caregivers, collecting data at the physiological level also provides a key piece of the puzzle. Physiological data helps researchers understand how emotional regulation develops and the degree to which it impacts various areas of the child development. In one component of the study, Calkins’ team attaches heart rate electrodes to each child to measure their physiological arousal and then presents them with a frustrating task. Two-year-olds are asked to open a cookie jar that was glued shut or wait to open a present, while 5-year-olds are tasked with unlocking a box using a set of keys that does not actually include the correct key. The team watches both the child’s actions as well as the caregiver’s responses. Did the children quit or did they stick with the task? Did the parent offer guidance or withdraw from the situation? Children and parents return to the lab for more advanced tests as they age. There are many ways children can rein in overwhelming feelings. Distractions, such as singing songs, diverting concentration, or engaging in self-soothing behaviors, can effectively control emotions. Knowing how to implement these behaviors helps a child navigate social and academic environments, says Calkins. They also help children stay focused on tasks and enhance their autonomy. When children have these skills, they can approach difficult situations without adult intervention. Drawn from “The Importance of Emotion Regulation,” UNCG Research and Engagement and “Right from the Start” by Whitney L.J. Howell. Read the story on UNCG Research and Engagement and the complete story in the 2016 spring issue of UNCG Research Magazine. The Office of the Provost is soliciting cross/multi/interdisciplinary research and creative activity proposals tied to the thematic areas of focus in the UNCG strategic plan: health and wellbeing, vibrant communities, and global connections. Faculty are being asked to review those three themes in the University Plan and consider responding to one of the three RFPs available to provide seed funding for teaching innovations or research tied to the Strategic Plan All proposals by faculty are due by December 9, 2016. Learn more at http://research.uncg.edu/seeking-proposals-strategic-seed-grants/. On Nov. 16 AHA Director of Development Cory Phillips presented the Fit Friendly Worksite Gold Achievement Award to HealthyUNCG. This award program recognizes employers who go above and beyond when it comes to their employees’ health, offering physical activity support, healthy eating options at work and a wellness culture. Organizations are rewarded for their progressive leadership and concern for their staff. The award is currently being displayed outside of the HealthyUNCG offices, Coleman 230, but will eventually be displayed in the Mossman Building. HealthyUNCG plans to apply for the Platinum Achievement in Spring 2017, which requires fulfilling all gold level criteria as well as demonstrating behavior change, cost saving outcomes or positive return on investment. This week, internationally-renowned cellist Lynn Harrell visits UNCG. He’ll hold a masterclass with advanced cello students and will play with the UNCG Symphony Orchestra on Friday evening, “a performance opportunity normally reserved for the world’s major orchestras,” said UNCG Associate Professor of Conducting and Director of Orchestras Kevin Geraldi. Harrell will also give a concert on Saturday as part of the University Performing Arts Series. Harrell’s appearance at UNCG is part of the “War and Peace Imagined” series. His cello teacher, cellist and composer Lev Aronson, was imprisoned in a Nazi concentration camp during World War II, and his musical scores and manuscripts are part of UNCG Libraries’ collection. Harrell is a frequent guest of many leading orchestras, including those of Boston, Chicago, New York, Philadelphia, San Francisco, Ottawa, Pittsburgh and the National Symphony. In the Friday show, Harrell will join Geraldi and the UNCG Symphony for a performance of Ernest Bloch’s Hebraic Rhapsody, “Schelomo.” The overture to Beethoven’s opera “Fidelio” and Mussorgsky’s magnificent “Pictures at an Exhibition” round out the program. It begins at 7:30 in UNCG Auditorium. Tickets for this performance are $10 general admission or $5 for students. Purchase tickets through the Triad Stage Box Office online by clicking here. You may also order tickets by phone from the Triad Stage Box Office, Monday through Friday, 12 to 6 p.m. or Saturday 2 to 6 p.m. by calling (336) 272-0160, or they may be purchased in person at the UNCG Music Building Box Office. Proceeds from ticket sales for this concert will go directly to the School of Music scholarship fund. Harrell’s Saturday recital will begin at 8 p.m. and tickets can be purchased online with a pre-sale discount here or at the door for $8-$35. This performance will be in the Recital Hall of the Music Building. “Painting is silent poetry, and poetry is painting that speaks.” This phrase of Plutarch’s describes one teaching innovation presently underway at UNCG. This fall, art lecturer Amanda Crary approached visiting assistant professor of poetry, Ansel Elkins, about a collaboration between their classes. Elkins found room in her syllabus for Crary’s idea and the work began. 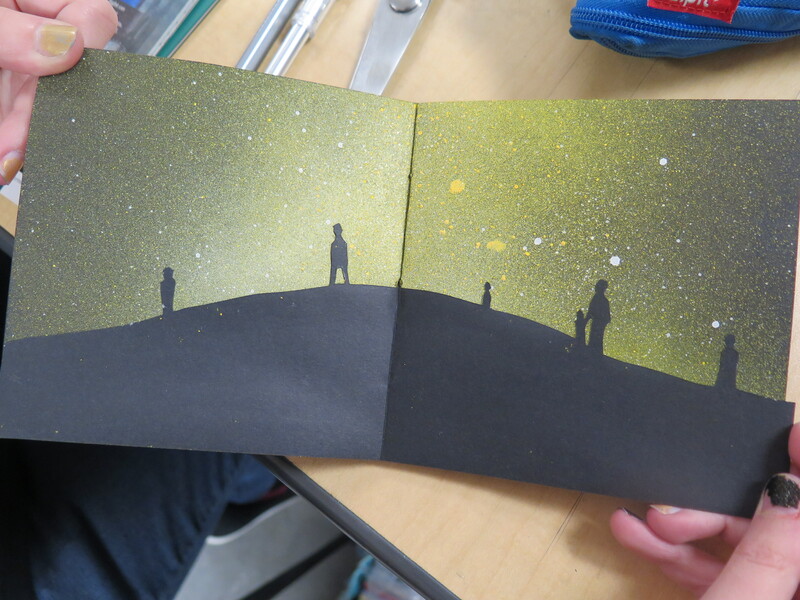 Elkins explained that on the poetry side, the collaboration encouraged the students to think more visually, and about concrete images, which she feels is essential in creative writing. Submitting poems to the art students was an optional project for Elkins’ students, but she had 100 percent participation. “They’re excited about seeing how their work is interpreted by someone working in a completely different medium,” she said. Crary’s students have read the poets’ work and considered, what Crary calls, “the mood and temperature” of the poems. Their creations, which are books of various sizes, are meant to be not only made up of illustrations, but to involve various textures and design principles to represent the poems. The artists were instructed to communicate with the poets as they undertook the visual projects. Crary says she’s also received a very positive response from her students concerning this project. Crary believes that having the poetry read will “activate the space in a stronger way” and will encourage the audience and participants to spend more time viewing the visual artists’ creations. “There’s something really powerful about hearing the words,” she said. Both instructors are looking forward to what they call “the unveiling” at Poiesis. “Words and art go hand in hand,” added Crary. Poiesis will take place in the Gatewood Studio Arts Center atrium on Monday, Dec. 5, at 5 p.m. and the public is invited to attend. The Poiesis project is just one example of an innovation in teaching at UNCG. The Office of the Provost is currently soliciting cross/multi/interdisciplinary research and creative activity proposals tied to the thematic areas of focus in the UNCG strategic plan: health and well-being, vibrant communities, and global connections. Faculty are being asked to review those three themes in the University Plan and consider responding to one of the three RFPs available to provide seed funding for teaching innovations or research tied to the Strategic Plan. Proposals are due by December 9. Go here for more information. The Staff Senate Service Committee invites you to help make the holidays a little brighter for five UNCG staff members and their families who have been selected to be recipients of the UNCG Staff Senate Angel Tree. Check out the Wish List for a list of needed items. Donations will be accepted through Dec. 7 and can be dropped off to: Lori Krise, 264 Mossman, Vickie Debari, 208 Sink or Connie Uselman, 401-D Bryan. Those who would like to donate but cannot shop for specific items are invited to give gift cards to Target, Walmart, or other grocery or drug stores. Visa and MasterCard gift cards are also requested. Contact Melissa Barnes (mkbarnes@uncg.edu) or Janeen Chastain (jkchast2@uncg.edu) with questions. 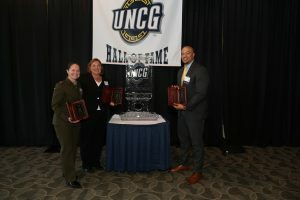 The UNCG athletics department inducted two former men’s basketball student-athletes in Courtney Eldridge and Jay Joseph along with two former softball student-athletes in Lara Long Smith and Leigh Irwin. This year’s UNCG Athletics Hall of Fame induction ceremony was held November 12. Eldridge (who spoke via Skype at the event) was a four-year letterwinner for the Spartans from 1998-2002 and helped the Spartans post three winning seasons during his career, including a 20-win campaign in 2001-02. He was part of the Spartans 2001 NCAA Tournament team that won the Southern Conference Tournament title and finished with a 19-12 record on the year. As a senior, he led the Spartans to the SoCon North Division co-championship and an appearance in the National Invitation Tournament (NIT) with a 20-11 record. He is the Spartans’ all-time leader in assists with 584. Joseph was a four-year letterwinner for the Spartans from 2000-04, including teammates with Eldridge for two years. He also was part of the Spartans 2001 NCAA Tournament team that won the Southern Conference Tournament title and finished with a 19-12 record on the year. As a sophomore, he led the Spartans to the SoCon North Division co-championship and an appearance in the National Invitation Tournament (NIT) with a 20-11 record. Joseph ranks second all-time in UNCG history in scoring with 1,646 career points. Long Smith was a four-year letterwinner for the Spartans from 1995-98. During her career, she guided the Spartans to the Big South regular season championship twice (1995, 1996) and the Big South Tournament title in 1997. Long Smith was named the 1998 Southern Conference Player of the Year and was a two-time all-conference selection (1995, 1998). Irwin was also a four-year letterwinner for the Spartans from 1998-2001 and was a teammate of Long’s her freshman year. Irwin was named the 2001 SoCon Player of the Year and was a two-time All-SoCon selection (2000, 2001). Former Track/Cross-Country athlete Paul Chelimo, who won the silver medal in the 5,000 meters at this year’s Olympics, was recognized at the start of the ceremony. Chancellor Franklin Gilliam Jr. presented him with the inaugural “Spirit of the Spartan” Award. He spoke of his life story and his running and academic career – and his progression through the Olympic competition in Rio. He praised his poise, sportsmanship, patience, discipline and drive. “His journey is a microcosm of our university’s journey,” the chancellor said. MBA students Michael Carlone, Alexis Mariani and Christopher Mannie presented a brand awareness strategic plan to the CEO and board of directors of Triad Adult and Pediatric Medicine (TAPM) on Friday, Nov. 18. The project was part of a brand management class taught by Dr. Merlyn Griffiths. Griffiths is currently working with TAPM on developing an internship program for graduate students. The Student Personnel Administration in Higher Education (SPAHE) M.Ed. program here at UNCG is once again seeking out offices and departments interested in sponsoring a graduate assistant(s) in their area for a 2-year appointment. The SPARK Employer Handbook and Job Description Form can both be found here in this Google Folder for your convenience. This year’s SPARK process will be held February 19-20, 2017, with a Meet-&-Greet for employers and prospective students held on the 19th and interviews conducted on the 20th. We would like to have completed job descriptions back to us by no later than January 31, 2017. We will upload the job descriptions onto a website for SPARK candidates to review. Likewise, we will be collecting résumés from those students invited to SPARK and will upload those onto a website for you to review. If you have any questions about the SPARK process, please do not hesitate to contact Brad Johnson (Brad.Johnson@uncg.edu) or Kynnith Francis-Vaughan (kjfranc2@uncg.edu), 1st-year SPAHE student who is also co-chairing SPARK Employer Relations this year. If you are looking for an opportunity to change the way you work with students – and change the way you look at your life, you can attend the 6th Life Design Catalyst Coach Training Program here at UNCG from December 13-16, 2016, sponsored by the HHS Advising and Personal Development Center and the School of Health and Human Sciences. As a participant, you will spend four days engage in various introspective and self-reflective activities, many used in the first-year Design Your Life courses (HHS125: What Could I Do With My Life and HHS135: Redesign a Life You’ll Love). These courses have not only been found to increase retention and graduation rates, but they have also been found to help students clarify a clear path in life. As a member of the UNCG community, you’ll receive a discounted rate for this Coach Training Program. Have questions? Contact Bill Johnson at whjohnso@uncg.edu or at 336-207-6795. The UNCG Athletics Department will host Faculty/Staff Appreciation Night on Friday, Dec. 9, at the UNCG Men’s Basketball game against Wake Forest at the Greensboro Coliseum. Tickets are $5 for UNCG faculty or staff and their guests. Tickets can be purchased online by clicking the link here. Enter ‘UNCG’ in the Special Offers Code Box, then scroll down until you see the UNCG F/S offer. Simply select the amount of tickets you wish to purchase and click ‘reserve.’ After confirming your purchase, you will need to build an account if you do not already have one. You can then proceed to the checkout. All pre-purchased tickets will be available for pick up at Will Call Dec. 9 at the Greensboro Coliseum starting at 5 pm. The game will begin at 7 p.m. For more information call 336.334.3250. Check next week’s Campus Weekly for a listing of all holiday season UNCG basketball games. The UNCG Humanities Network and Consortium (HNAC) will host a lecture by renowned historian Heather Ann Thompson titled “The Attica Prison Uprising of 1971 and Its Legacy: Why History Matters to Mass Incarceration Today” on Thursday, Dec. 1, at 7 p.m. at the International Civil Rights Center & Museum. The lecture is based on her book “Blood in the Water: The Attica Prison Uprising of 1971 and Its Legacy,” which sheds new light on the uprising, the state of New York’s violent response and the victims’ quest for justice. The book, called a “masterly account” by The New York Times, was a 2016 National Book Award finalist. UNCG is partnering with NC A&T State, the International Civil Rights Center & Museum and the National Humanities Alliance to host the lecture, which is free and open to the public. The event is being held in conjunction with States of Incarceration, a national traveling multimedia exhibition on mass incarceration that is on display at the museum. UNCG is one of 20 universities nationwide to participate in this exhibition. The UNCG Ashby Dialogues will host a final discussion of the fall semester at noon on Dec. 2, in the Pecky Cypress Room of the Alumni House. This session, titled “Race, Activism and Campus Speech,” is intended to be a summing up of the fall themes and will include discussion of Black Lives Matter, free speech and student activism. Pizza and soft drinks will be served. This event is supported by the Ashby Dialogues program, the College of Arts and Sciences, the Department of Anthropology and Sociology and the African American and African Diaspora Studies Program. Contact Robert.anemone@uncg.edu for disability accommodations. The UNCG MFA Writing Program and The Greensboro Review will host a poetry reading by MFA alumna Julie Funderburk on Thursday, Dec. 1 at 7 p.m. in the UNCG Faculty Center on College Avenue. The reading will celebrate the release of Funderburk’s first full-length collection, “The Door That Always Opens,” forthcoming from LSU Press. Funderburk’s poetry has appeared in Ploughshares, Best New Poets, The Cincinnati Review, The Greensboro Review, 32 Poems, and Hayden’s Ferry Review. She is assistant professor of creative writing at Queens University in Charlotte, North Carolina. The event is free and open to the public and will be followed by a book signing. Just in time for the start of exam studying, here is a look at Jackson Library’s newly renovated first floor Reading Room. Check it out. Michelle Lamb Moone has been named as the new associate vice chancellor for human resources at The University of North Carolina at Greensboro. Moone has over 25 years of human resources experience. Moone received a bachelor of science degree in Human Resources Management from the University of Maryland and a master of science degree in Applied Behavioral Science from Johns Hopkins University. Most recently, she held leadership positions at Howard University in Washington, DC, including senior director for talent management; director of compensation for performance management and HRIS; and director of organization development and change management. Moone is a certified Senior Professional in Human Resources (SPHR) and a member of several professional organizations, including the College and University Professional Association of Human Resources, Society for Human Resources Management and Organization Development Network. Moone will assume her leadership role on December 12, 2016. She replaces Deb Carley, who has served as the interim associate vice chancellor for human resources since spring 2015. I would like to extend a sincere thank you to Terri Shelton, chair, and members of the search committee; and faculty and staff, who participated in this very important search. Please join me in congratulating and welcoming Michelle Lamb Moone as associate vice chancellor for human resources. We are excited about her addition to the UNCG campus community. Dr. Rebecca Muich (Lloyd International Honors College) is the editor of the Lloyd International Honors College newsletter, which has recently won first place in the National Collegiate Honors Council newsletter contest, Faculty/Administrator Electronic division. See this link for the latest issue. Dr. Connie McKoy (Music Education) has co-authored “Culturally Responsive Teaching in Music Education: From Understanding to Application.” The text presents teaching approaches that are responsive to how different culturally specific knowledge bases impact music learning. Designed to meet the needs of pre- and in-service music teachers who want to learn how to develop culturally responsive approaches to music instruction, the book provides examples in the context of music education, with theories presented in Section I and a review of teaching applications in Section II. The book is written by McKoy and V. R. Lind; the book is published by Routledge. Dr. Cerise L. Glenn (African American and African Diaspora Studies, Communication Studies) has been named the recipient of the 2016 Outstanding Book Chapter Award by the African American Communication and Culture Division of the National Communication Association. The book chapter appearing in “Critical Examinations of Women of Color Navigating Mentoring Relationships” examines the mentoring experiences of African American female graduate students aspiring to become tenure-track professors. Additionally, Glenn has been named the recipient of the 2016 Feminist Teacher/Mentor Award by the Organization for the Study of Communication, Language, and Gender. Glenn is the program director of African American and African Diaspora Studies as well as an associate professor in the Department of Communication Studies. She teaches courses on communication and culture. Erin Ellis (University Speaking Center) has been elected first Vice Chair of the National Communication Association’s Communication Centers Section. Kim Cuny (University Speaking Center, Communication Studies) has been appointed Student Advocate of the National Communication Association’s Communication Centers Section. Dr. Omar H. Ali (Lloyd International Honors College) was recently interviewed on NPR station WFDD 88.5 discussing young black voters, independents, partisanship, the electoral process, and the ways in which we can connect with each other. The NPR Interview is at http://www.wfdd.org/story/democracy-and-pitfalls-party-politics. Dr. Roy Schwartzman (Communication Studies) was a nonpartisan expert political communication analyst throughout election night (Tuesday, Nov. 8) on Time Warner/Spectrum Cable News. His commentaries were broadcast throughout the evening from Senator Richard Burr’s headquarters in Winston-Salem. UNCG’s Weight Watchers at Work will hold an open house Wednesday, Nov. 30, at 12:15. The session is an opportunity to see how a meeting is conducted, to meet current participants and to ask questions that will be answered by group leader Donna Sexton. The program is a twelve-week series designed to be informative and motivational, and the weekly meetings range from 45 minutes to an hour. The next series begins Wednesday, Dec. 7. The introduction and the first meeting will be in MHRA 3501, and they are open to the entire UNCG community, including faculty, staff and students. For more information, contact Elizabeth L’Eplattenier at 334-3410 or email ebleplat@uncg.edu. You can also find the group on Facebook at www.facebook.com/UNCGWWatWork. UNCG Opera Theatre will present Gian-Carlo Menotti’s one-act holiday opera, “Amahl and the Night Visitors,” Nov. 18 and 19 at 7:30 p.m. and Nov. 20 at 2 p.m. The show, which includes full costumes, scenery, a professional orchestra and choral singing, is appropriate for family audiences. Tickets are are $16 general admission, $14 for senior citizens and $8 for students. They available for purchase at the Triad Stage Box Office at 232 S. Elm St, Monday through Friday 12-6 p.m., by phone at (336) 272-0160, online at http://opera.uncg.edu or at the door one hour prior to performances. All performances will be in the UNCG Auditorium at 408 Tate St.
On the first Friday afternoon of November, members of the Peabody Park Preservation Committee (PPPC) and the Office of Sustainability held an ivy pull in the historic Peabody Park Woods, a 115-year old mixed hardwood forest behind UNCG’s Music Building and Cone, Grogan and Philips-Hawkins residence halls. Seventy-five were in attendance; many students, as well as alumni, staff and community members. UNCG biologist and Peabody Park Preservation Committee (PPPC) chair Dr. Elizabeth Lacey led the pull, teaching the teams to look for different types of invasive plants, such as English ivy and bush honeysuckle. The goal was to remove the invasive species, to restore and maintain the woods as a forest characteristic of the North Carolina piedmont. Groundskeepers and PPPC members Kevin Siler, Wally Morales and others assisted with the event and in leading students. “It’s a good opportunity for students—they earn credit hours and learn something by getting their hands dirty,” Siler said. Locally prominent landscape architect, tree advocate and PPPC member Randal Romie also came to help. The park’s forest contains a diverse group of tree species that range in size from young saplings to large canopy trees. It is also home to many animals, particularly birds. Two small creeks run through the park and empty into North Buffalo Creek, on the north side of Friendly Avenue. First established as 125-acre area, the park was envisioned as an educational space, and today it is still used by multiple departments. In the first fifty years, it hosted May Day festivals and even had a man-made lake where concerts and pageants were held. The ivy pulls are conducted once each semester and have been going on for ten consecutive years. Dr. Lacey says that in restoring the forest, “progress is slow, but in the past few years we have begun to see the success of our efforts.” The Peabody Park Preservation Committee has been active since 1997 and, in 2010, received the Greensboro Beautiful annual service award. Led by conductors Kevin M. Geraldi and John R. Locke and graduate conductor J. Ben Jones, the Symphonic Band will play “Selections from ‘The Danserye’ by Susato, “Cane River Murals,” by Ellerby, “Amazing Grace,” by Himes and “Sound and Smoke,” by Cuong. World-renowned cellist Lynn Harrell will join conductor Kevin M. Geraldi and the UNCG Symphony for a performance of Ernest Bloch’s Hebraic Rhapsody, “Schelomo.” The overture to Beethoven’s opera “Fidelio” and Mussorgsky’s magnificent “Pictures at an Exhibition” round out the program. Tickets for this Symphony Orchestra performance are $10 general admission or $5 for students. Purchase your tickets through the Triad Stage Box Office online by clicking here. You may also order tickets by phone from the Triad Stage Box Office, Monday through Friday, 12 to 6 p.m. or Saturday 2 to 6 p.m. by calling (336) 272-0160, or you may buy tickets in person from the UNCG Music Building Box Office. Directed by conductors John R. Locke, Kevin M. Geraldi and graduate conductor William L. Lake, the Wind Ensemble will feature the Student Artist Competition winner saxophonist Emily Loboda. The ensemble will perform “Downy Overture,” by Novarro, “Saxophone Concerto,” by Creston, “Symphony in B-flat,” by Hindemith,” “Masks and Machines,” by Dooley, “Danza Finale–Malambo from ‘Estancia’’ by Ginastera and “‘The Earth’ from ‘Planets’” by Nagao. UNCG is hosting States of Incarceration, the first national traveling multimedia exhibition and coordinated public dialogue on mass incarceration, through Dec. 15 at the International Civil Rights Center & Museum in downtown Greensboro. The exhibition is organized and produced by The New School’s Humanities Action Lab (HAL), a national hub where the humanities and design generate curricula and public engagement with social issues. The HAL coalition comprises 20 university partners across the country, including UNCG, Arizona State University, Brown University and Duke University, among others. Over the past two years, each university worked to develop a section of the exhibition that focuses on an issue of incarceration that is unique to its community. Led by Dr. Anne Parsons, museum studies students in UNCG’s history graduate program investigated North Carolina chain gangs in the 1920s and worked with the International Civil Rights Center & Museum to develop public programming. UNCG students began researching and developing content for the exhibition in August of 2015. Their primary research sources were letters written by chain gang prisoners to their families and state government officials. For master’s student Sonya Laney, the project was an opportunity to gain valuable, real-world experience in her field. The exhibition, designed by design firm Matter Practice, opened in New York City in April. The Greensboro showing is free and open to the public Mondays through Saturdays from 10 a.m. to 3 p.m. Guided tours – led by individuals directly affected by incarceration and student curators – are available for a fee. An opening reception and open mic night will be held on Friday, Nov. 11, at the museum. To register for the opening reception and other States of Incarceration events throughout November and December, visit go.uncg.edu/incarceration. UNCG’s participation in the national project is sponsored by the Gayle Fripp Public History Fund, the College of Arts & Sciences, the Department of History, the National Endowment for the Humanities and the Open Society Foundation. Trying to make sure everyone in our community has access to quality food is no small task. But a multidisciplinary approach may be the key for Guilford County. Dr. Marianne LeGreco is a faculty member in Communication Studies, and Dr. Stephen Sills in Sociology, but their work with the Center of Housing and Community Studies allows them to focus on local issues in collaboration with faculty and students from at least six other UNCG departments. Those include Geography, Nutrition, Public Health, Computer Science, the Nursing School and Environmental Studies and Sustainability. Among the Center’s nonprofit partners are the Guilford County Cooperative Extension Office, Greensboro Farmers Market and the Out of the Garden Project. That widespread collaboration, they say, was crucial to the City of Greensboro’s recent attainment of the $470,000 Local Food Promotion Program Implementation grant for its Fresh Food Access Plan. LeGreco has been involved in community food concerns since 2007, eight years before the Greensboro-High Point metropolitan area was ranked by the Food Research & Action Network as No. 1 in food hardship rates nationally. In 2014, Greensboro received a U.S. Department of Agriculture grant of $25,000 for an assessment of food resources, which meant that LeGreco, her colleagues, and her nonprofit partners were able to begin the task of methodically assessing Greensboro’s food access needs. They investigated Guilford County’s food deserts, or areas with very limited access to fresh food, and they hosted events such as Local Food Storm, where they mapped food access in Guilford County. To this end, LeGreco worked with Sills and the Center for Housing and Community Studies. Due to their work alongside others, the Greensboro-High Point area has moved from No. 1 to No. 9 in its food hardship rate. The new, much more sizable grant provides a tremendous push for all those working to solve Greensboro’s food access problem, making it possible to track and monitor information about in more detail at a community level. LeGreco and Sills will carry out this research by communicating with focus groups, local health care professionals and residents who are affected. Their ultimate goal is to create a research tool that is grounded in the community, and which could be transferrable to other communities’ food access studies. The grant also provides funding for several shared-use kitchen spaces in food desert areas. These kitchens, in public locations, can be used by multiple groups producing food commercially. LeGreco, Sills and their partners are working toward the kitchens’ upgrades to meet the food producers’ needs and commercial requirements. There is currently a teaching kitchen at the Greensboro Farmers Curb Market, and a shared kitchen at the North Carolina Cooperative Extension. Kitchens managed by Greensboro Parks and Recreation are becoming available as well. The Fresh Food Access Plan includes guidance and planning assistance, so that small farmers and food business entrepreneurs can “get over the hump,” as LeGreco says, and begin selling food commercially. The grant will help small farmers navigate the food certification process, which, as a new farmer himself, Sills has found challenging. LeGreco and Sills will also continue to bolster the activity of community gardens and map housing issues and health problems along with food access. Much of LeGreco and Sills’ work is embedded in classes with undergraduates or graduate students, and Sills also hosts a discussion series, Housing Hangouts, at the Center of Housing and Community Studies. Students, faculty and members of the community who want to learn more about improving Greensboro’s food access and addressing other community issues, are encouraged to contact the Center and to watch for upcoming Housing Hangouts through the Facebook page. The Guilford Food Council Year-End Potluck will be Dec. 6 at 6 p.m. at the Guilford County Cooperative Extension at 3309 Burlington Rd. All are invited to celebrate the Fresh Food Access Plan grant and to learn more. Note: The Geography department has been included in the paragraph 2 listing. Teaching is one of the pillars of UNCG’s historical excellence. Students are drawn to UNCG and its outstanding, creative faculty, knowing how much they will learn. The Office of the Provost is soliciting cross/multi/interdisciplinary research and creative activity proposals tied to the thematic areas of focus in the UNCG strategic plan: health and wellbeing, vibrant communities, and global connections. Faculty are being asked to review those three themes in the University Plan and consider responding to one of the three RFPs available to provide seed funding for teaching innovations or research tied to the Strategic Plan. Campus Weekly regularly includes pieces about great research – and in the coming weeks we’ll highlight a sampling of innovations in teaching around campus over the past year. All proposals by faculty are due by December 9, 2016; Learn more at http://research.uncg.edu/seeking-proposals-strategic-seed-grants/. Although UNCG’s State Employees Combined Campaign (SECC) solicitors gathered last week in the Alumni House for the SECC wrap-up event, the campaign is still accepting pledges through December. Currently, UNCG is approximately $20,000 away from its goal of $199,999. At the event, campaign chair DiAnne Borders thanked solicitors for all of their hard work throughout the campaign and discussed ways to continue to reach out to faculty and staff in the coming weeks. “We’ve done really well, and we’d really, really, really like to get to that goal so that we can have an even larger impact on the lives of North Carolinians, both in our community and across the state,” Borders told solicitors at the luncheon. Through the SECC, UNCG faculty and staff can select from more than 1,000 charities across the state, nation and world. Pledges can be made online using ePledge or via the paper pledge form. The ePledge site can be accessed at ncsecc.org. For more information about UNCG’s campaign, visit secc.uncg.edu.